A load cell (or loadcell) is a transducer which converts force into a measurable electrical output. Although there are many varieties of lsensors, strain gage load cells are the most commonly used type. Before strain gauge based load cells became the method of choice for industrial weighing applications, mechanical lever scales were widely used. Mechanical scales can weigh everything from pills to railroad cars and can do so accurately and reliably if they are properly calibrated and maintained. The method of operation can involve either the use of a weight balancing mechanism or the detection of the force developed by mechanical levers. The earliest, pre-strain gauges force sensors included hydraulic and pneumatic designs. In 1843, English physicist Sir Charles Wheatstone devised a bridge circuit that could measure electrical resistances. 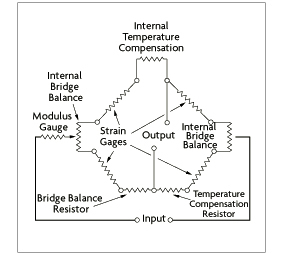 The Wheatstone bridge circuit is ideal for measuring the resistance changes that occur in strain gauges. Although the first bonded resistance wire strain gauge was developed in the 1940s, it was not until modern electronics caught up that the new technology became technically and economically feasible. Since that time, however, strain gauges have proliferated both as mechanical scale components and in stand-alone load cells. Today, except for certain laboratories where precision mechanical balances are still used, strain gauge load cells dominate the weighing industry. Pneumatic load cells are sometimes used where intrinsic safety and hygiene are desired, and hydraulic load cells are considered in remote locations, as they do not require a power supply. Strain gauge load cells offer accuracies from within 0.03% to 0.25% full scale and are suitable for almost all industrial applications. In applications not requiring great accuracy, such as in bulk material handling and truck weighing mechanical platform scales are still widely used. However, even in these applications, the forces transmitted by mechanical levers often are detected by load cells because of their inherent compatibility with digital, computer-based instrumentation. Load cells represented the first major design change in weighing technology. In today's processing plants, electronic load cells are preferred in most applications, although mechanical lever scales are still used if the operation is manual and the operating and maintenance personnel prefer their simplicity. In this page you find a weighing system design with load cells.